Image: Two children are walking in a forest. They appear to be carrying PDAs; there are many public electronic devices (phones, ATMs, internet booths) on the trees; there is a cctv camera on a tree; there is a spy satellite overhead; and one of the background trees is in fact a communications mast. Peering out from behind a tree towards the back of the scene, a witch following them is studying her own PDA. 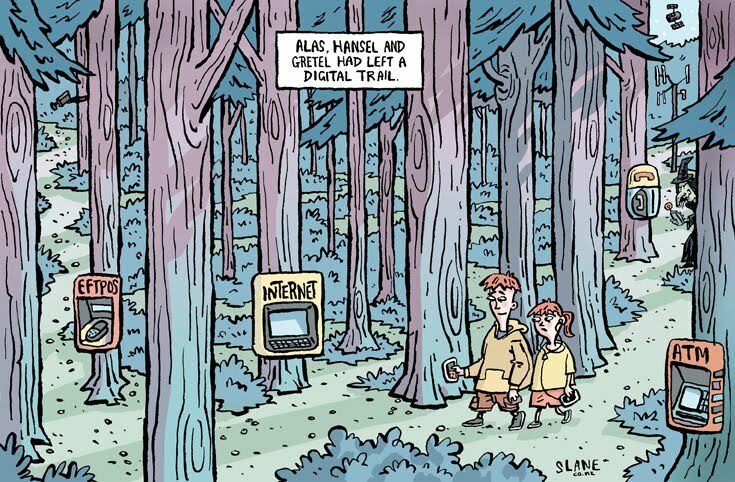 Caption: Alas, Hansel and Gretel had left a digital trail.